Despite having offensive firepower in one-handed catching sensation Odell Beckham Jr. and rookie running back Saquon Barkley, the New York Giants sit at the bottom of the NFC East standings after winning just one of their first six games for the second straight season. Much to the chagrin of Giants owner John Mara, Beckham Jr. has been outspoken about his dissatisfaction with the team’s early-season performances. In an interview with Business Insider, Barkley revealed why he has chosen to keep his opinions under wraps through the media firestorm surrounding the franchise. 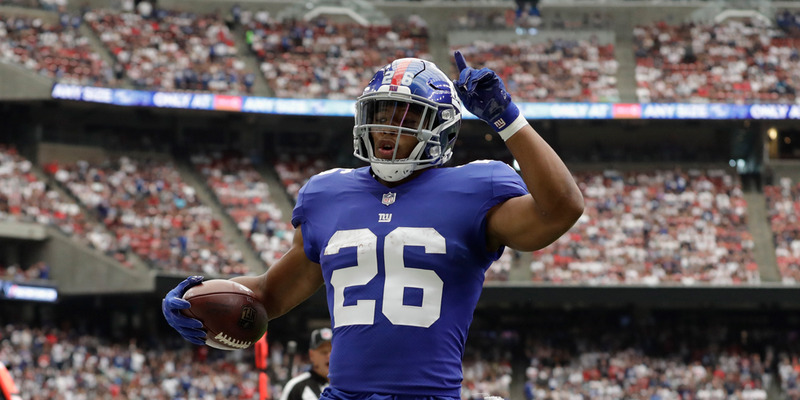 While veteran quarterback Eli Manning plays defence against accusations that his time under center has come to an end and star wide receiver Odell Beckham Jr. questions his team’s heart in sit-down interviews with ESPN, New York Giants rookie phenom Saquon Barkley is content keeping his thoughts to himself. It’s not that the Giants’ first-round draft pick has no opinions about the state of his 1-5 team and the chaos surrounding the New York franchise. He just knows better than to voice them publicly. Business Insider spoke with Barkley after he surprised high schoolers at the launch of the latest version of Visa’s Financial Football – a game geared at teaching young people about personal finance and money management. A product of Penn State, Barkley imparted wisdom to the students – some of whom were just three years his younger – about the importance of handling money responsibly and with caution. His approach to finances closely resembles the one he takes with the media.